Benny (Matthew Frias) and Christopher (Edmund Donovan) meet at college when they play football together. They quickly become friends and that soon turns into a fledgling relationship with the two falling for one another. As Benny and Christopher get closer, the two decide to spend spring vacation with Christopher’s mother Carol (Amy da Luz) but a tragic secret from the past is revealed that ties the boys’ mothers for life. As Benny and Christopher try to process the revelation, they navigate the possibility of still pursuing their relationship despite the huge hurdle they face with both of their families. Akron is a fairly difficult film to review without ruining the secret that gives the film an unexpected emotional gut punch. 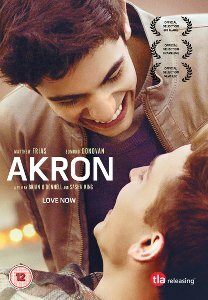 Without giving much away about that major plot point, Akron is a sensitive and progressive LGBT film that is a welcome relief from the subject matter that is served by most movies in the genre. Benny and Christopher’s sexuality is treated as irrelevant and insignificant here and that’s so refreshing. Both of their families are supportive of their sons encouraging them to date and be themselves. There’s no painful coming out story and there’s no conflict with the family around sexuality. Instead the film focuses on the blossoming of young love and it’s all the better for it. Matthew Frias and Edmund Donovan are electric in their roles, fostering a believable chemistry quickly. You root for their relationship to succeed despite the adversity that lies in their way. Both characters are fully formed and confident in themselves, and their sexuality, and their interactions feel genuine. You can feel the love falling off the screen and that’s one of the things I loved about this movie. Once the secret at the heart of the movie is revealed, it’s intriguing to watch how it plays out. The affect on Benny and Christopher, as well as their families, is pretty raw but you see the characters working through it as they scramble to find a resolution that works for everyone. Akron very much paints a positive picture of families working to resolve their differences and support one another, even in the most difficult of circumstances. The only issue I really had with the film, and to be honest it’s a small one, is that a lot of coincidence comes to play. Once the secret is out, you can’t help but ask yourself ‘what are the chances?’ but you quickly put that to one side. It has to be that way for the plot to work, and I get that, but for some viewers they may feel like it’s all a bit too convenient. That small complaint aside, Akron is a film that handles difficult subject matter in a sensitive and engaging way. The performances of its leads are superb and the film packs in a lot of emotion. For me though it’s biggest triumph is highlighting that sexuality doesn’t have to define you and that families can be accepting and supporting no matter who you love; that’s something that has been sorely missing from LGBT cinema.